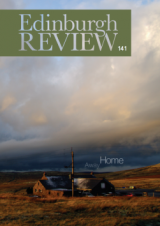 Edinburgh Review was a partner of the Eurozine network from February 2007 to December 2012. Scotland’s leading journal of ideas, the Edinburgh Review publishes essays, short fiction, poetry, and reviews aimed at an educated reading public with an interest in critical thought. Since its inception in 1802, the magazine has balanced a strong Scottish focus with a keen interest in international intellectual currents.